Is this document for you? This guide is for people who were a member of the Federation last year and wish to renew their membership for the coming season. If you are a member of a Membership Organisation you will probably want them to renew your membership for you, as they will receive a discount of £1 on the fee if they do so. The easiest way to renew your membership is through our on-line system; the rest of this guide walks you through that process. 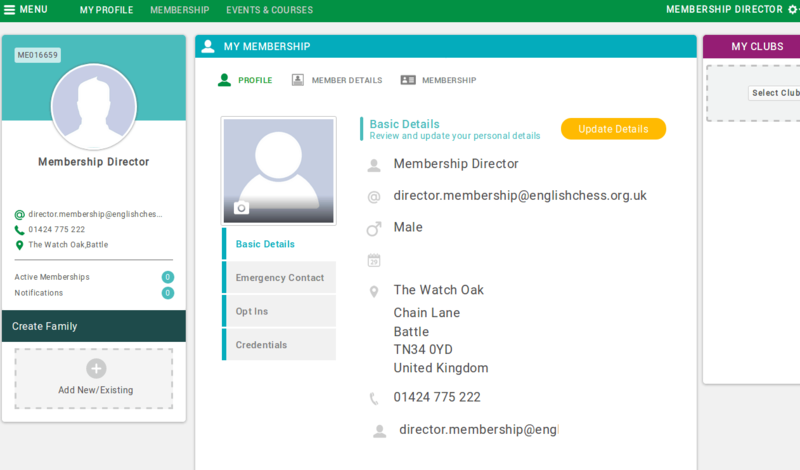 If you encounter any difficulties please contact us at membership@englishchess.org.uk, or by telephoning the ECF Office on 01424 775222. Please bear with us during the transition to this new system while the staff are still in the process of becoming familiar with it. or your bank details if you wish to pay your membership by Direct Debit in future. Our membership system is operated by a company named Azolve Inc, who use GO! Membership as a marketing name. 1) Open your web browser and go to ecf.azolve.com to go to the login page. 2) If you have not previously created a password on the system enter your username and click the Forgot password link. The system will send you a confirmation e-mail containing a link which, once followed, will enable you to set your new password and will then offer to allow you to proceed to log in. 3) If you have previously created a password on the system then enter your username and password on the login screen and click Login. 4) You will see a screen on which you may choose to opt in to various communications from the ECF and the provider. GO! Membership. We recommend that you sign up to the Federation’s monthly electronic newsletter. Tick whichever boxes you wish and click Continue. 5) You will now see a screen on which the various Terms & Conditions you are required to accept by either the Federation and GO! 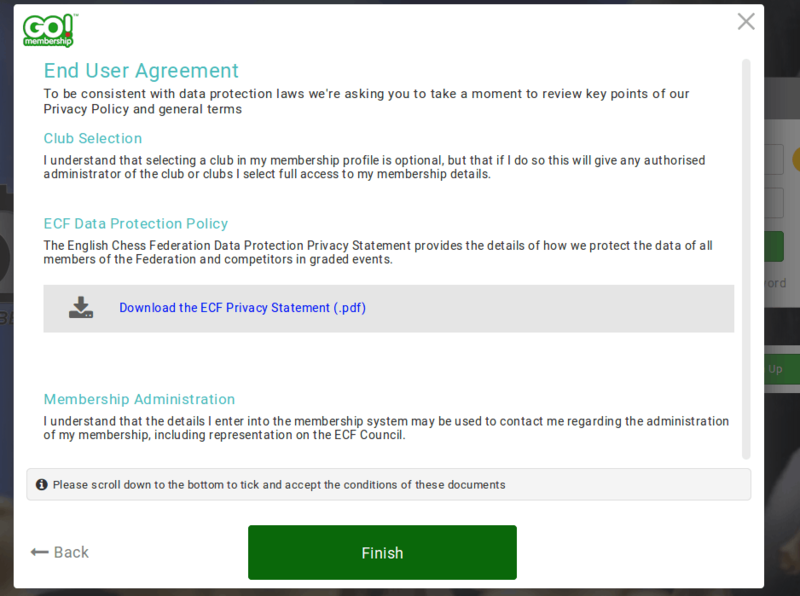 Membership to permit us to retain the data necessary to administer your membership. The Finish button on this screen will not work until you follow the instruction to scroll down to the bottom of the screen, below all the Terms & Conditions documents, and tick the tick box which appears below: see next screenshot. 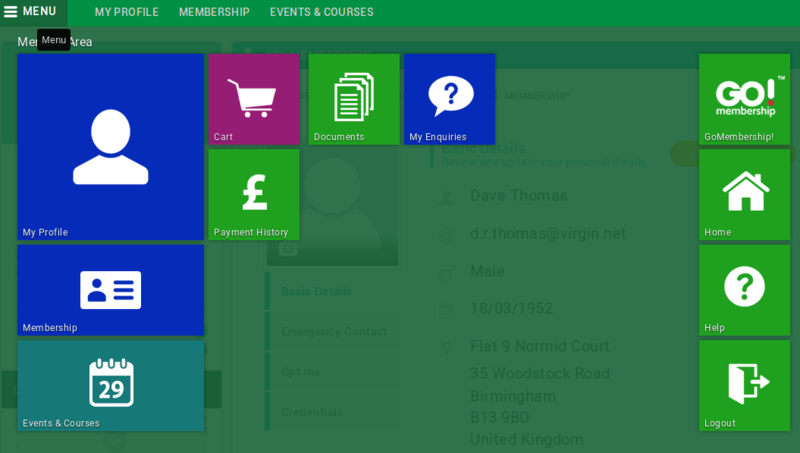 6) You will see the Profile screen, which contains a summary of your details as recorded on the system. If any details have changed or are missing you can click the Update Details button to go to the Membership Details Form and edit your details. If the Date of Birth field (identified by the calendar icon) is blank, as in the example above, then the first time you log in you must click Update Details and enter something in the Date of Birth field. 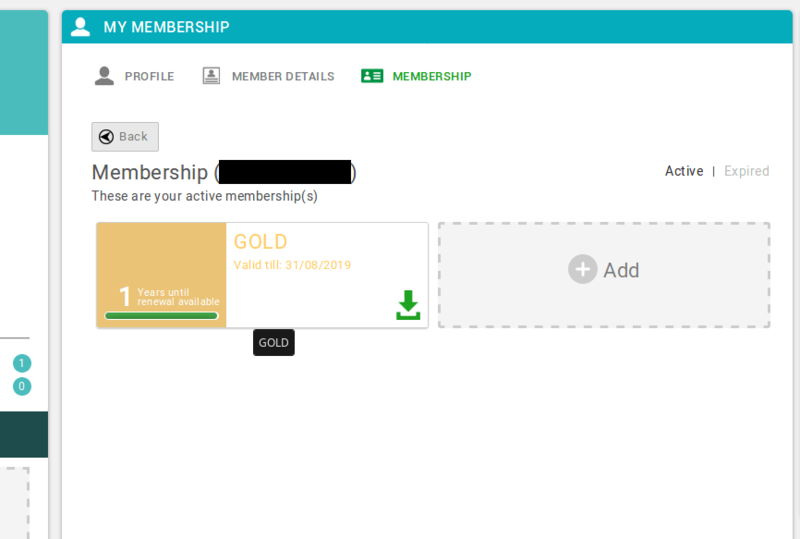 Clicking Save on the Membership Details Form will return you to the Profile screen. 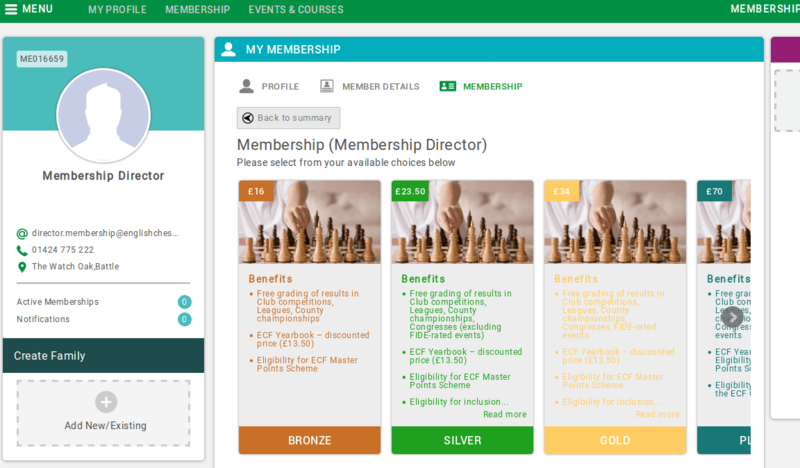 8) Click the Add button and you will be taken to a screen showing the choice of memberships available to you. 9) Click on the icon for the membership category in which you wish to renew. The icon will change to show which category has been selected. 10) You will see a box showing your ECF Grading Reference. 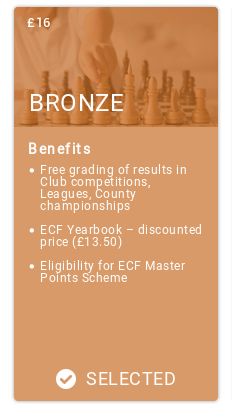 If you have a grading reference and it is not stored in your profile (which should happen only in cases of error if you are renewing) please use the link to look it up on the ECF Grading Database and enter it. You will also see a note about associating your membership with a club. 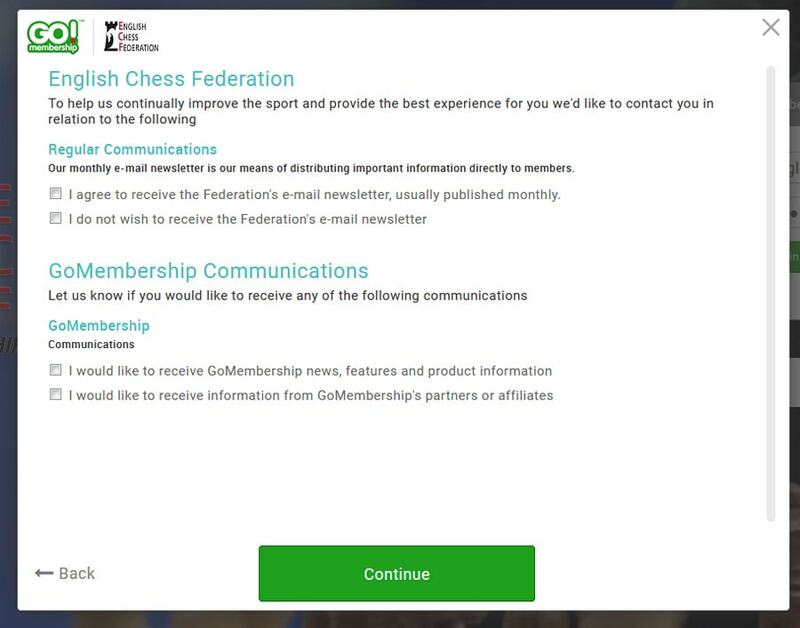 Please note associating your membership with a club in this system enables an authorised administrator for that club to access your membership details. It is our intention in the future to give this right to club secretaries or treasurers; consequently for Data Protection reasons we have been unable to import the bulk of the club data from our old membership system into the new one. 11) A pop-up box should appear informing you that your new membership has been added to your shopping cart and offering the choice of paying now or later. 1) If you did not take the option of paying immediately you had selected your new membership then you can return to the shopping cart by clicking on the MENU item to the left of the MY PROFILE item at the top of the screen, and selecting the Cart icon from the menu screen. 2) You will be shown a summary of the items in your shopping cart, to enable you to verify that the memberships being purchased are correct. You have the options of removing an individual item, or all items in the cart, but if everything is in order you should click Checkout. 3) The next screen asks you to confirm that your profile details are correct; click Next to proceed. 4) You are taken to the checkout screen, where you again have the option of deleting items from the basket. This is also where you select your method of payment. Although there is an option Pay via Bank please be aware that this option is setting up payment by Direct Debit. The majority of members will probably wish to choose the Pay by Card option. 6) You will be taken to a summary screen from which you have the option of printing off a PDF receipt. 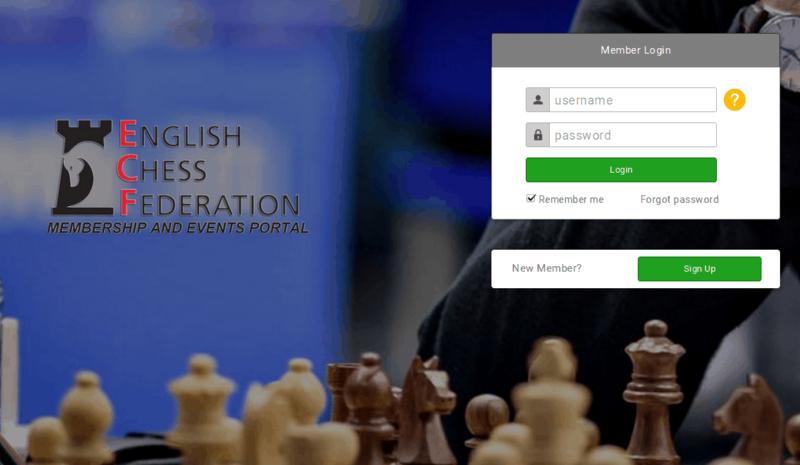 You will receive an email Payment Receipt Confirmation from membership@englishchess.org.uk to the e-mail address you registered with; this is your receipt of payment. You will receive a second e-mail Membership Purchase Confirmation from the same sender which will confirm your membership type, membership number, and expiry date. We use your membership data only for the purposes of administration of membership. This includes making contact in connection with your right of representation on the ECF Council. If you chose to subscribe to it on the opt-ins page we will add you to the circulation list of our eNewsletter, which appears approximately bi-monthly. You may chose to unsubscribe from this at any time. To do so, log in to the membership system, click the Opt Ins item in your profile, and remove the tick against the newsletter item. We publish name, membership number and category (including expiry date), grading reference, and any club specified in your membership record for both current members and those whose membership has recently expired. This information is provided for organisers to determine your eligibility to compete in events. The only data which is transferred between our membership and grading databases is membership number, category, and grading reference. In addition date of birth may be used to assist in determining whether records in the two databases refer to the same individual. However, the majority of members join the Federation in order to meet the requirements of an event in which they wish to compete. You should be aware that such events will usually submit their results to the ECF for grading, and that these results will be published on line and remain indefinitely as an historical record.